Wondering how to start the raw food diet, also known as the raw vegan diet? It’s a common question. You’ve heard about the benefits that a diet of raw fruits, vegetables, nuts and seeds can have on the body and mind, but how can you go about changing the way you eat and starting your new life on the raw food diet? And where can you find a raw food diet meal plan? Raw food diet plans are not that revolutionary. In fact, raw food diet plans have been around for thousands of years. Let’s not over complicate things! Raw food diet plans are simply another word for eating fresh foods. That’s it. Simple! And what are these raw foods? Well, you can take a look at my raw food grocery list below for a thorough overview. But, in sum, raw food diet plans are simply based around eating nothing but fresh, unprocessed fruits, vegetables, sprouted grains, unprocessed nuts and unprocessed seeds. If you are wondering whether raw food diet plans are for real or are right for you, of course they are! Everyone should be eating more real fresh fruits and vegetables. Now, whether you should eat an all raw food diet is another story! Raw food diet plans don't have to be complicated. Simply incorporate more raw fruits and vegetables into your diet. You can use raw food diet recipes to help you incorporate more of these healthful foods into your diet on a daily basis–regardless of whether you eat a low, high or all raw food diet. Why do you want to start the raw food diet? Understanding the reason why you want to become a raw vegan will help you to see the big picture of your health and your quality of life. If you truly want to make a change in your life and you’re ready to work hard and see results, then you will have the will and drive to take action towards starting the raw food diet. That’s the most important step when starting the raw food diet! What will you do when you feel like reverting back to the standard American diet? When figuring out how to start the raw food diet you’ve got to have a plan for what you will do when faced with cravings and awkward social situations that revolve around food. Have you given any thought to what you will say or do in these situations? Start with a plan so that you’re ready to execute your plan when faced with these situations. What do you need to buy in order to start the raw food diet? Let’s get to the nitty gritty, right? If you’re wondering how to start the raw food diet you are probably looking for some basic information, such as what do you need to buy and what will you need to succeed? There’s a lot of hype about superfoods and fancy equipment. Some raw fooders will tell you that all you need to get started on the raw food diet is a fridge full of fresh fruits and veg. Sounds simple enough, right? Many people also use dehydrators when eating only raw vegan foods. However, if you’re just getting started you don’t need a dehydrator. You can always get one at a later date. Next comes the important part: the food! All items on this raw grocery list should be organic and raw where possible. It is not always feasible to buy everything organic, and I don’t even always buy organic. However, aim for the gold standard when it comes to your raw grocery list — where possible! This is a sample basic raw grocery list to give you a general idea of what might be found in a typical raw foodist or raw vegan kitchen. Now, wondering what raw appliances to buy for your raw food kitchen? Your blender is the most crucial part of being a raw vegan. Blenders are used to make smoothies, puddings, sauces, and much more. I recommend the VitaMix. It's the best blender you can get, it's large, but it isn't cheap! There is no alternative to a good blender. If you must, you can use a cheaper, personal blender but I guarantee that your existing blender will not blend as well and the motor will burn out over time. Don't feel bad if you can't afford one right away. But plan on buying a VitaMix at some point soon. At least put it on your Christmas list! You need a blender and a food processor. This here is a great food processor, but you do not need such a good one. My honest recommendation is to use the food processor that you have at home. If you do not have a food processor then simply go to your local big box store and choose a medium priced food processor (perhaps in the $50 range). Invest any extra money into the VitaMix blender above, please! NOTE: Yes, you need a blender AND a food processor. Blenders do smooth, liquidy stuff (smoothies, soups, sauces) and food processors do chunkier stuff (think raw cookie dough, pizza dough, raw pie crusts, etc.). I suggest buying a crappy (cheap) food processor and an awesome (expensive) blender. Also, check out my handy recommended raw food products list here. The list includes a wide variety of raw appliances, from blenders and food processors to manual juicers and spirooli slicers. The list also includes some great idea for edible raw food specialty items, including chia seeds, nutritional yeast, kelp noodles and much more. Wondering what you're going to eat on a raw food diet plan? Curious what’s in a typical raw food diet menu? Much like regular eaters who eat standard American diet fare, raw food diet menus can vary per person based on different food preferences and dietary needs. Raw food diet menus can also vary hugely based on how much time you want to dedicate to preparing your raw meals! If you are anything like me, odds are you’re busy running errands, working, spending time with family and keeping your life on track. While cooking (or “uncooking”) can be a pleasurable hobby, most of us don’t want to spend hours creating complicated items for your daily raw food diet menu. I advocate making simple, satisfying raw food diet menus to ensure your success with the raw food lifestyle. Breakfast: Raw diet menus tend to include a green smoothie for breakfast. Alternatively, breakfast may include a large serving of fruit, or even raw granola or raw oatmeal made from sprouted grains. Morning Snack: For a mid-morning snack, a raw diet menu may typically recommend a few pieces of fruit and a small serving of raw nuts or seeds. Lunch: A raw diet menu may include a variety of options for raw vegan lunch, including salads with some healthy fat (such as avocado, extra virgin olive oil or crushed nuts), a soup, and/or a raw vegan entree (such as raw noodles, raw veggie burgers, raw vegan “meatloaf,” etc.). Afternoon Snack: Most raw vegans snack during the afternoon. An afternoon snack on your raw diet menu might include raw crackers, some fruit, vegetables and dip, or even a piece of raw vegan cake or a bowl of raw vegan pudding. Dinner: For dinner, many raw diet menus are similar to a raw lunch menu. However, they might incorporate a denser entree item, which is typically made predominantly from nuts. An example from my typical raw diet menu might be a veggie burger patty wrapped in a lettuce wrap and topped with raw ketchup and raw mayonnaise. Similarly, raw pizza, which is “cooked” in a dehydrator at low heat is a definite favorite. Dessert: And what’s the best part of a raw vegan diet menu? Why, dessert of course! Try raw cheesecake (dairy-free of course), raw brownies, sweet raw puddings, and much more. All of these raw diet menu dishes can be made at home quite easily with some basic raw food appliances. Are you up for 30 days of raw food? If you’re considering going raw for 30 days I encourage you to go for it! 30 days raw can have a powerful effect. Many people go raw for 30 days and on the last day they actually don’t want to eat standard American diet foods. That’s what happened to me. Let me tell you my 30 days raw story. In 2001, I became a vegetarian. However, I was a “junk-food vegetarian.” In other words, I ate vegetarian foods but they were anything but healthy. In fact, I barely ever ate any fresh fruits or vegetables. Almost everything I ate was processed, and items like chips, candy, cheese buns, packaged cookies, cinnamon buns, tofu dogs smothered in cheese and ketchup, and much worse were on my plate daily! I felt tired all the time, and I had very bad acne even though I was well past puberty. In 2009 I decided to make a major change in my life. I was over-weight for my height, lethargic, moody, unhappy and low energy. After witnessing a family member’s amazing transformation with raw foods, I decided to start my own 30 days raw just to see whether I could do it for a short time. I certainly didn’t have any inkling that I would go raw and stay raw ever since! Yes, it’s true, after my 30 days raw I decided to stay raw for Day 31, too. And when I woke up on Day 32, I realized that I felt and looked so much better that I didn’t want to eat standard American foods. And so, since my 30 days raw in 2009, I’ve stayed raw for years now–and I’m still going strong. 30 day raw diet plans can be helpful for a variety of reasons, including weight loss and simply resetting your tastebuds to appreciate real, unprocessed foods. It can be overwhelming and a bit daunting to try to figure out what to eat when you’re on a 30 day raw diet plan. Especially if you’ve never eaten these types of foods before! 49% standard American diet junk food, such as cookies, chips, cheese, dairy, full-fat meats, potato chips, soda pop, candy, refined sugars, poultry, deep fried foods, etc. 40% healthful cooked food choices, such as lentils, brown rice, steamed vegetables, rice wraps, very limited dairy, meats and poultry, little to no refined sugars, etc. When going raw for 30 days you’ll experience more positive effects the higher your raw foods ratio. When opting for a high raw vegan diet (80%+), it is again important to make sure that the non-raw options that you incorporate into your diet are also healthful choices. Most people find it more difficult to eat raw when out of the house, at social events or at restaurants. When going raw for 30 days and when following a high raw vegan diet, a good option is to eat close to 100% raw at home, and then opt for the healthiest non-raw options possible when at social events and other places where you must eat out of the house. Eating 100% raw vegan–or close to it–is actually the best option for many. Some people find it easier to eat 100% raw for 30 days because they have, in fact, removed the temptations by calling every cooked item untouchable for 30 days. For some, this is the easiest way to do raw food for 30 days. Raw food – 30 days… Are you up for it? If so, it’s important to consider which one of these raw for 30 day approaches will work best for you. 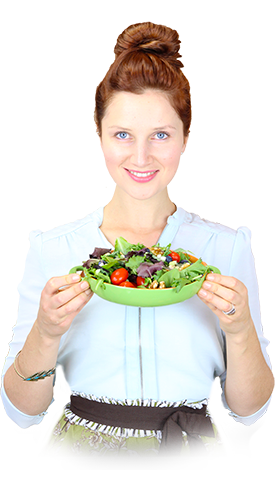 Want to have a look at a 100% raw 30 day raw food diet meal plan? They can be difficult to find for free on the internet. So, I thought I’d pull this one together for you based on my experiences over the past few years as a raw vegan. Here’s my 30 day raw food menu for you, which you can use a sample to help you figure out some ideas for what to eat re: a 30 day raw food menu. Wondering what to expect if you experience 30 days of raw food? Everyone has a slightly different personal experience with 30 days of raw food. However, the overall results are quite amazing and follow a general pattern. This discussion assumes that you’re following a 100% raw food diet (or very close to 100%). For the first week it’s tough. You’re going to have a difficult time breaking your normal patterns and having to figure out what to eat and when. You’ll also find that you’re quite hungry, so you’ve got to make sure you’re eating lots and lots of food! The raw food diet is not about restricting calories. You’re actually going to find that for your first 10 days or so on raw food you’re going to spend more time eating (I mean physically chewing and sitting at the table) because you need to eat more food than you’re used to eating. In the first 10-15 days and perhaps even longer you’ll be experiencing some detoxification, whereby your body is getting rid of a lot of the junk it has stored in your body. So, prepare to go to the washroom more often than your used to. This can mean having a bowel movement (sorry!!) after every meal! Fresh fruit and veggies have a lot of fiber in them, and most people are not used to going to washroom so frequently. By the end of your 30 days of raw food you will have learned some valuable raw food preparation skills, will have lost weight, and will have actually found some real food recipes that make your heart pitter-patter and your tastebuds salivate! Raw Food Meal Plan – Is It Necessary? If you want to go raw for an extended period of time, a raw food meal plan is not necessary for you to follow a raw food lifestyle. Although I sell a 30-day supported raw food meal plan program that’s awesome, you may not need one. However, there are some of us who do well with raw food meal plans, while others honestly have no need for meal plans. Will you benefit from a meal plan? Whether you need a raw food meal plan is totally up to you. People who benefit from following raw food meal plans enjoy structure and organization. You might be considered more of a Type A personality. Someone who likes structure, planning and having a set of guidelines to follow. You probably prefer to know what’s coming rather than be blind-sided by a crisis. Does that sound like you? Then if you’re interested in raw foods you will benefit from following a raw food meal plan. Raw food meal plans are not for everybody, but if you’re interested in launching yourself into the raw food lifestyle the right way and right away, consider whether a 30 day raw food meal plan is the leg up that you’ve been looking for. Is it really possible to lose weight with a raw food diet plan? What about eating as much as you want and still losing weight? Yes, losing weight with raw foods is totally possible, and basically guaranteed. But the raw food diet plan is not a magic pill that will allow you to eat anything you want and still lose weight. It’s not magic. It’s rational, focused and it works. The raw food diet plan is all about reality and hard work. Losing weight with the raw food diet plan requires hard work and will power. But the rewards are guaranteed and trust me when I tell you that you will learn to enjoy the taste of healthy food. If you stick with raw eating, you will, I promise. Losing weight with the raw food diet is not about restricting pleasure or eating your greens because you have to. You’ll only lose weight with the raw food diet if you actually stay with it and retrain your taste-buds and your thinking. Raw food is not something that you do for a week to lose those last five pounds; that’ll never work because you’ll just gain the weight back again. In order to lose weight and be happy on raw foods you’ve got to become excited about your food and raw recipes. You’ve got to learn to get excited about fruits and vegetables! Trust me, you will. Wondering how to get started losing weight with the raw food diet? The first step is to get mentally prepared. Losing weight with raw food diet — it is possible. Raw Food Diet Meal Plans – What Makes a Good One? What makes a good raw food diet meal plan? 1. An effective raw food diet meal plan… isn’t complicated! For the love of nancy, if your life is like mine you’ve got about a gazillion things you should be doing and raw food just can’t be that complicated in your life. OK, I love to go out to a raw restaurant and have raw lasagna and raw cheesecake and all kinds of crazy delicious good raw stuff, but puh-lease I don’t have time for a high-falluting raw food diet meal plan on weeknights–or even on weekends for that matter! So let’s have reasonable recipes that don’t take very long to prepare, OK? 2. An effective raw food diet meal plan…tastes shockingly satisfyingly delicious! In case you don’t know this about me, the only reason that I am raw is because it tastes uber-super-delicious. If I was bored with my raw food diet meal plan I’d be off of this raw food bandwagon so fast you would only see smoke flying through the air where my body used to be lying horizontally on the bandwagon. In my raw food diet meal plan world raw meals are simple to prepare and they satiate you just like standard American diet (“SAD”) food used to. Yes, you can still have a lovely belly-is-full and “I am so happy after that meal” feeling. 3. An effective raw food diet meal plan…focuses on *your* favorite foods. Hate bananas? Love hazelnuts? Grossed out by avocado? Look, you are the boss of you. If you don’t like something that some raw foodists say must be in your raw food diet meal plan, then don’t eat it! It’s that simple. And if, on the hand, you find a recipe that you absolutely love, make it often and enjoy yourself! The beauty of raw foods is that everything you eat is healthy. It’s alive! It’s natural. So if you want a raw strawberry smoothie for breakfast, then go for it. All I say is that you must learn to love greens in order to have a balanced raw food diet meal plan. But, do not fear. If you aren’t totally raw, you will learn to love your greens. (I promise!) But for some people that might be kale, for others it might be baby spinach, or romaine, or mesclun. Listen to your tastebuds and don’t let anybody else boss you around! 4. An effective raw food diet meal plan…should make you feel great. The raw food lifestyle is not about pining away for the foods you used to eat and it’s certainly not about feeling hungry. Effective raw food diet meal plans should leave you feeling satiated, full, and energized. If you are transitioning to a raw food diet meal plan from a very junky meal plan, like I did, then you will go through some detox so at the beginning you might not feel so hot. But after the first week you’ll be on the upswing. Rule of thumb? If you’re hungry, eat! Fruit, vegetables, nuts, seeds, desserts for dinner, entrees for breakfast, whatever you like is fine. Just eat raw and don’t let yourself go hungry. 5. An effective raw food diet meal plan…should include some serious standby recipes. An effective raw food diet meal plan for you must contain some recipes that you absolutely love to eat and make. This is crucial, because if your raw food diet meal plan doesn’t contain anything that you LOVE you are going to have nothing to turn to when you hit a rough patch. Find your raw comfort food. Mine is various types of chia pudding or raw macaroni and cheese, but you might want something completely different. The point is to identify a sweet and a salty favorite recipe as part of your raw food diet meal plan, and make sure you always have the ingredients to make those comfort-food raw recipes on hand. I hope you’ve found my overview of the raw food diet and my sample raw food meal plan helpful. My purpose is to inspire you to try this amazing lifestyle, one bite at a time. It is an honor and a privilege to get to live my life's purpose. Thank you for being here and for sharing your journey with me. I am just a normal person who literally trained myself to love to eat healthy food. If I can do it, then I know you can too. Welcome to the world of raw food, and I can't wait to help you be an even healthier, happier more vibrant you. The first step is to make a raw recipe right now or this weekend! Subscribe to my free email newsletter now and you'll get a PDF copy of 11 of my most popular recipes. Add your name immediately below! Not sure where to go next? Suggestions! You want to eat better but don't where how to start. Check out the Start Here section. You want to browse the free recipes. Check out the big list of free raw recipes here. You need to know what equipment to buy. Check out recommended appliances, including blenders, food processors and more. You have a specific question. Check out the FAQs or send The Rawtarian an email. Big list of raw food recipes here. Watch It In this video, The Rawtarian shows you how to make juice in her Breville juicer.